Red Cherry (Rhinestone) #D005 (D / 005) lashes are black faux lashes with a row of shiny rhinestones on the lashband. Red Cherry (Rhinestone) #D008 (D / 008) lashes are criss-cross style black faux lashes with a row of shiny rhinestones on the lashband. Red Cherry (Rhinestone) #D011 (D/011) lashes are criss-cross style black faux lashes with a row of shiny blue rhinestones on the lashband. Red Cherry (Rhinestone) #D012 (D/012) lashes are graduated criss-cross style black faux lashes with a row of shiny rhinestones on the lashband. Red Cherry (Glitter) D602 (D / 602) lashes are full black faux lashes with colored metallic strands (magenta, red, gold, silver, blue, red, purple) and two rows of sparkly glitter. Red Cherry (Glitter) D603 (D / 603) lashes are full black faux lashes with colored metallic strands (magenta, red, gold, silver, blue, red, purple) and two rows of sparkly circular glitter disk. Red Cherry (Glitter) D604 (D / 604) are black faux lashes with strands of metallic (gold, aqua, magenta, blue, purple, red, and green), accented with three rows of silver glitter. Red Cherry (Glitter) D605 (D / 605) are black faux lashes with strands of metallic (gold, aqua, magenta, blue, purple, red, and green), accented with two rows of silver glitter. Red Cherry (Glitter) D608 (D / 608) lashes are full black faux lashes with two rows of sparkly glitter. Red Cherry (Glitter) D609 (D / 609) are blunt cut styled black faux lashes with two rows of sparkly glitter. 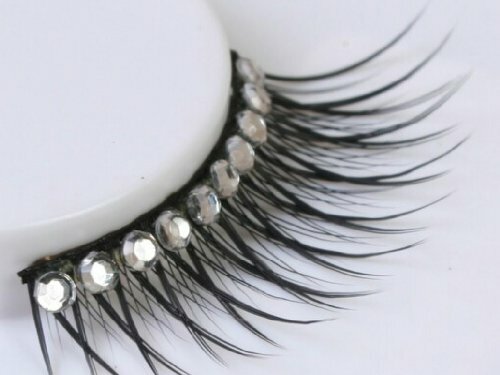 Red Cherry (Glitter) D612 (D / 612) are black faux lashes accented with two rows of silver glitter. Red Cherry DEL are extremely subtle black false lashes, adding just a tiny hint of length and volume.